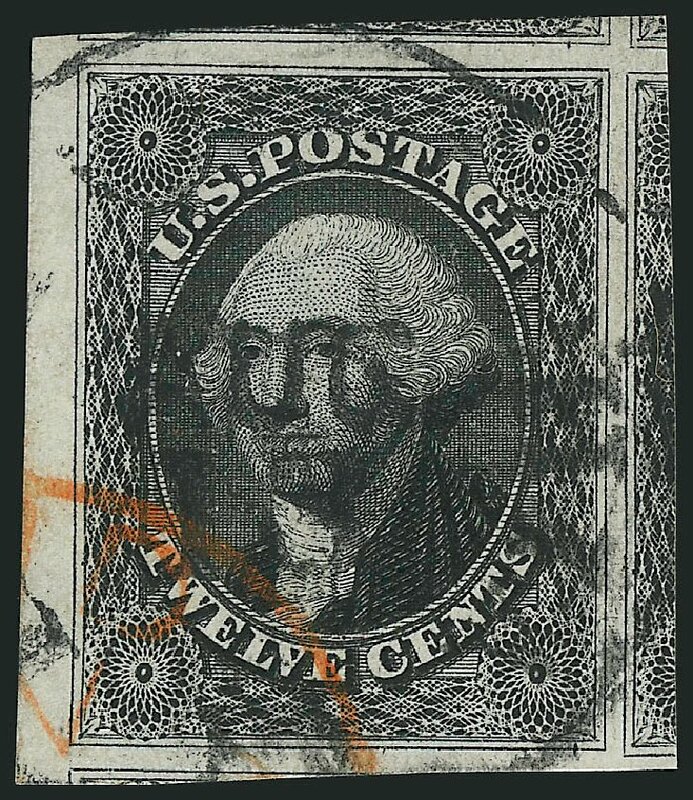 USA (Scott 17) 1851 WASHINGTON 12¢ BLACK Black cancellation. Four margins, sound, very fine. 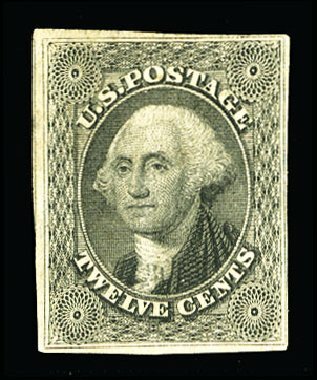 (1980 PF Cert #89207) Cat $250. 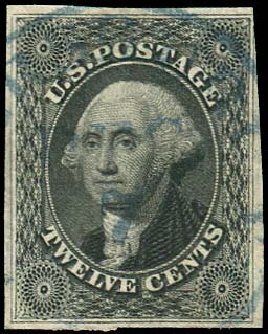 USA (Scott 17) 1851 WASHINGTON 12¢ BLACK, BLUE CANCEL Postally used with blue town cancel. 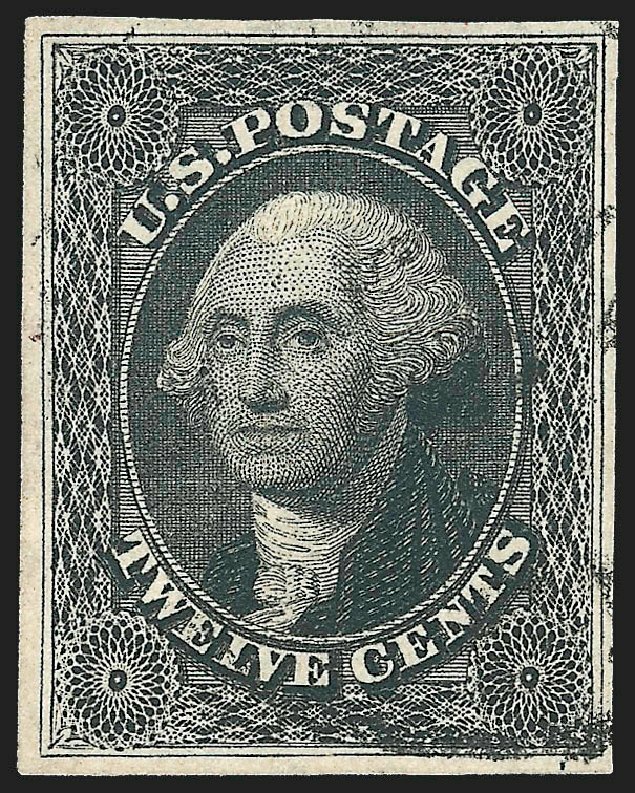 Very fine appearing, faint pressed-out crease upper right, good margins but just touching upper right corner. Attractive. Cat value $265. 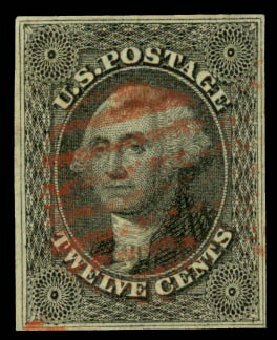 1851, 12¢ gray black (Scott 17), red grid cancel, four clear ample to large margins all around, attractive single, Very Fine. Scott $260. Estimate price $200 – 300. 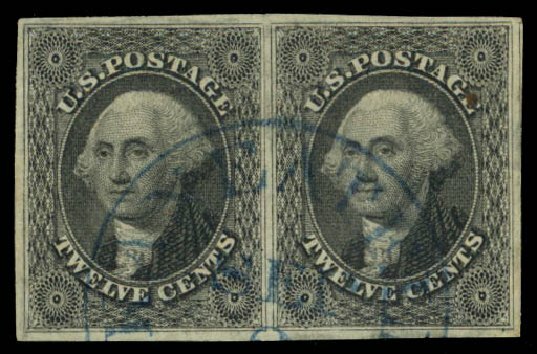 1851, 12¢ gray black (Scott 17), horizontal pair, gorgeous blue town cancellation, marvelous multiple with astounding color, a beautiful Jet-Black shade, with well balanced margins on all sides; pressed out vertical crease in right stamp, otherwise Extremely Fine to Superb, with 1992 P.F. certificate. Scott $590. Estimate value $500 – 750. 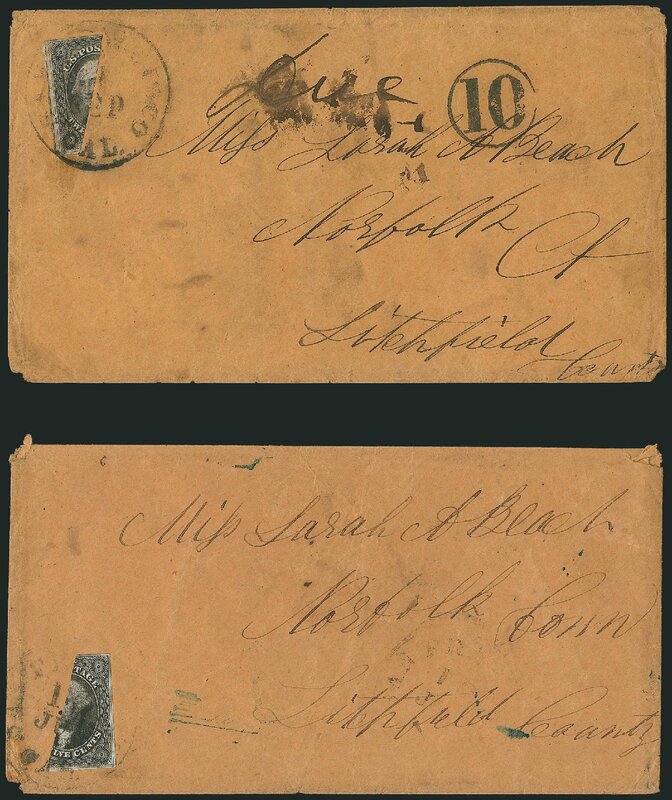 1851, 12¢ gray black (Scott 17), horizontal pair, extremely attractive multiple signed and plated by Ashbrook as positions 65-66L1, lightly struck black town cancellation, extremely rich color; central thin spot affects left stamp, Very Fine appearance. Scott $575. Estimate price $300 – 400. 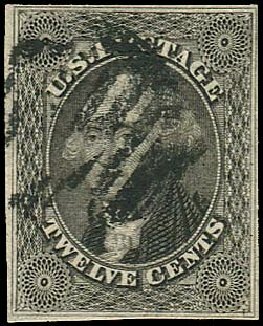 United States 1851-57 Issue 1851 12c black, horizontal pair, margins all around, tied by New Orleans cds on small piece, v.f. 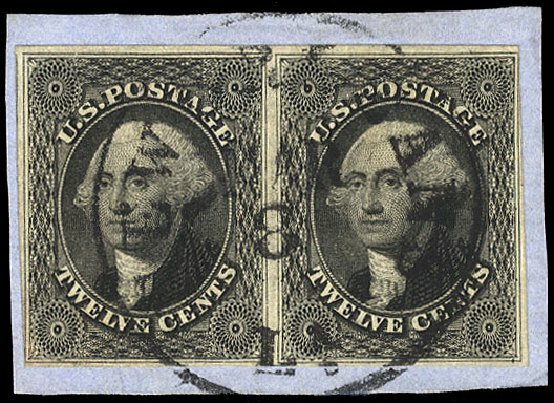 12c Black, Diagonal Half Used as 6c (Scott 17a). 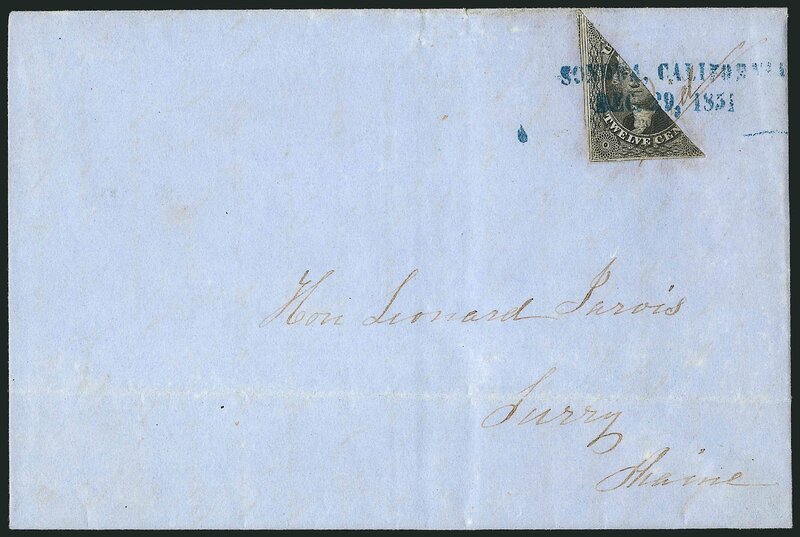 Bottom left diagonal half, tied by well-struck blue “SONORA, CALIFORNIA, DEC. 29, 1851” two-line datestamp on blue folded letter to Surry Me., manuscript “Paid” partly under stamp, light horizontal file fold well below the bisect VERY FINE. 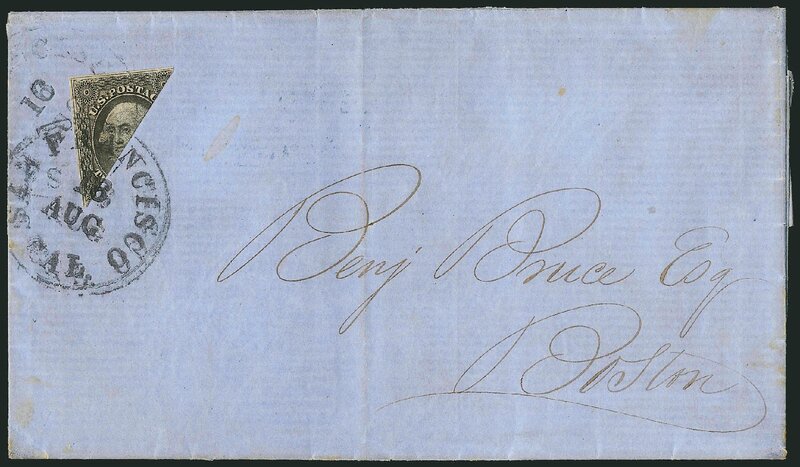 THIS IS THE EARLIEST RECORDED BISECTED USE OF THE 12-CENT 1851 ISSUE FROM CALIFORNIA, AND ONE OF ONLY FIVE LEGITIMATELY USED BISECTS FROM SONORA. A PHENOMENAL EXHIBITION ITEM, OFFERED TO THE MARKET FOR THE FIRST TIME SINCE OUR 1978 AUCTION OF THE J. DAVID BAKER COLLECTION. 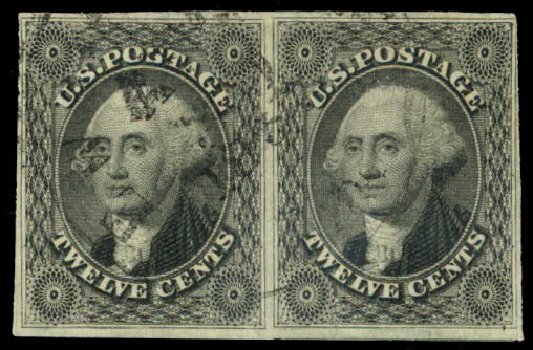 The 12c stamp was bisected to pay the 6c transcontinental rate, effective July 1, 1851, due to a shortage of 3c and 1c stamps. The next earliest use from Sonora is Jan. 7, 1852. 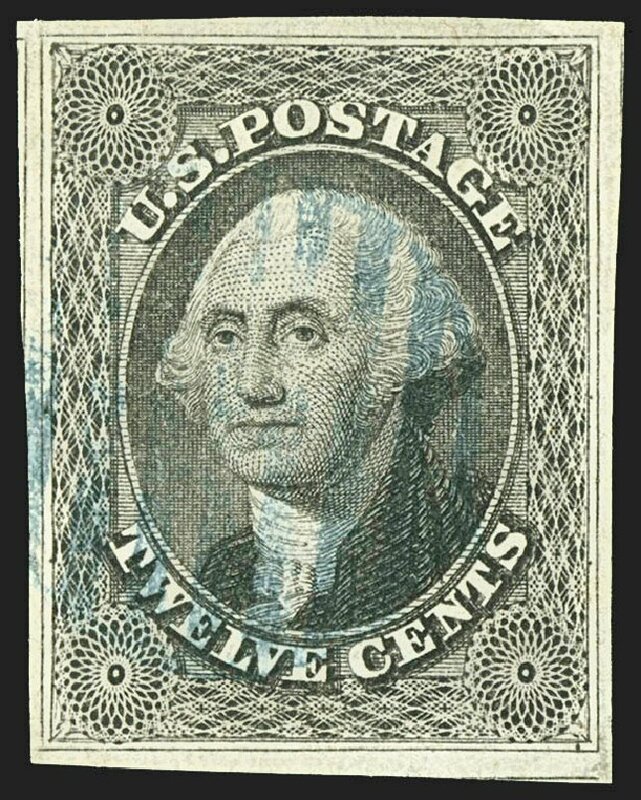 Seven bisects are known used from Sonora, and it is believed only five were recognized as valid for postage. Illustrated in Baker’s U.S. Classics on p. 200. Illustrated in Letters of Gold on p. 110. Ex Caspary and J. David Baker. 12c Black (Scott 17). Position 81L1, original gum, large margins to full including part of adjoining stamp at right and huge left sheet margin, crisp impression, shows an interesting plate scratch in left margin EXTREMELY FINE. 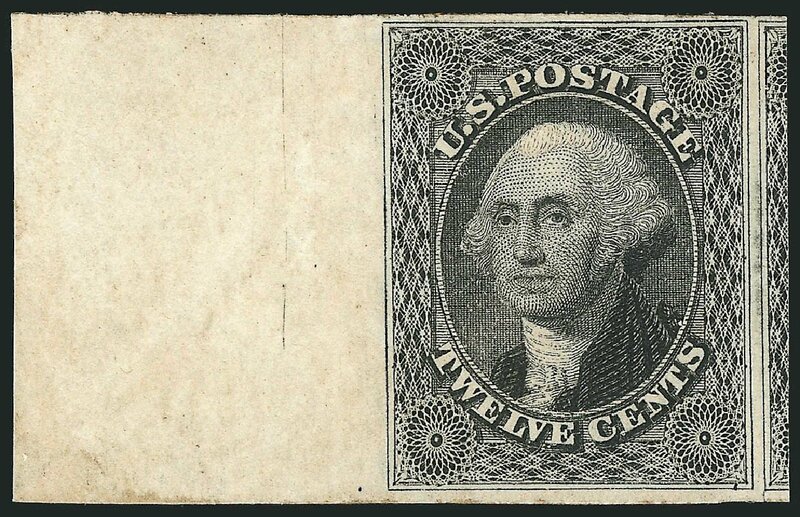 A STUNNING ORIGINAL-GUM SHEET-MARGIN EXAMPLE OF THE 12-CENT 1851 ISSUE. As James Allen recently determined (see Chronicle 244), the early state of the 12c Plate 1 did not have an imprint. This stamp comes from the first position of the ninth row, where there was no imprint even in the late state of the plate. However, judging from the sheet margin, at one time it might well have been attached to the “key” original-gum block pictured in the article (Figure 3, Positions 61-62/71-72L1E). With 2015 P.F. certificate (VF-XF 85 XQ). 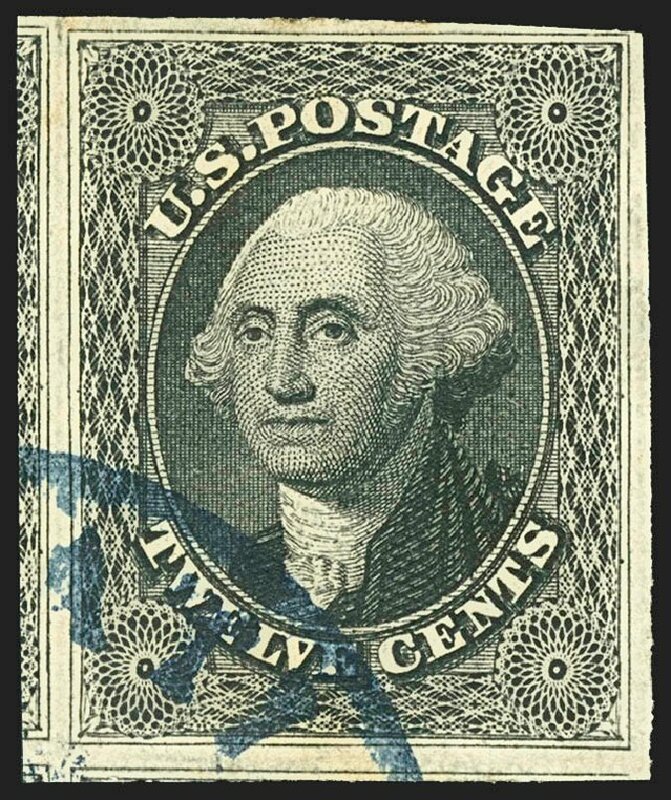 The “XQ” in the grade is used for stamps of extraordinary quality.